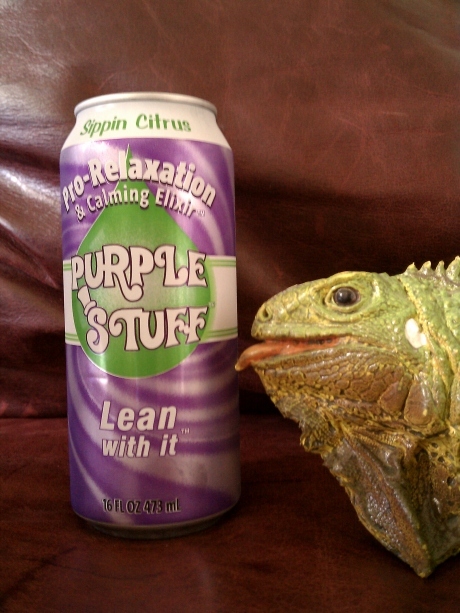 In the category of classy soda names, Purple Stuff – Sippin Citrus is definitely not listed. That of course doesn’t mean I won’t review it, you wouldn’t be reading this if I hadn’t. This was given to us by a citizen of the Carbo-Nation… one Chaz Cavenaugh. Purple Stuff is a self described “Pro-Relaxation & Calming Elixir” much like Drank. You can tell it’s trying a bit too hard to associate it self with hallucinogenic drugs because the font is very “Willy Wonka” and there is a crazy purple vortex behind said font. Well enough babbling it’s time to “Lean with it” as the can says. Well after I cracked it open and “Leant with it” for a little bit, I noticed that it has little to no aroma. While true that most citrus beverages don’t have much of an odor, some part of me thought that this one just might. Granted part of the fake history on the back of the can does say “Quench your thirst with some casual glamour as you sniff the aroma of purity.” Casual glamour, really? Oh by the way, the actually color of Purple Stuff is insanely light purple… very disappointing. Alright, it’s time to sip. Do you with Sprite tasted more like an energy drink? If so, then Purple Stuff – Sippin Citrus is for you. To break it down a bit more, the initial flavor is like that of a watered down, generic, energy drink. The middle is where you taste the Sprite… with a lot less carbonation; and the finish is the energy drink flavor again. It leaves a lighter version of Sprite film in your mouth, so I guess it’s got that going for it. Listed under the “Caveat” on the back of the can reads this, plus many more sentences…”Purple Stuff is healthy, fun, and the taste is out of this Purple World!” No, no it’s not. It does have B vitamins, but also a host of chemicals thus negating any real health benefits. It’s not fun in the slightest; in fact this is one of the more annoying cans I’ve ever come across. The only one that could possibly be true is that it has a taste out of this Purple World. The Earth isn’t purple, so I can only assume an alien race of street wise aliens from some purple planet brought this with them. Lucky us. Verdict – Buy a Bottle. Although you probably can't tell... Twist is in fact "leaning with it"